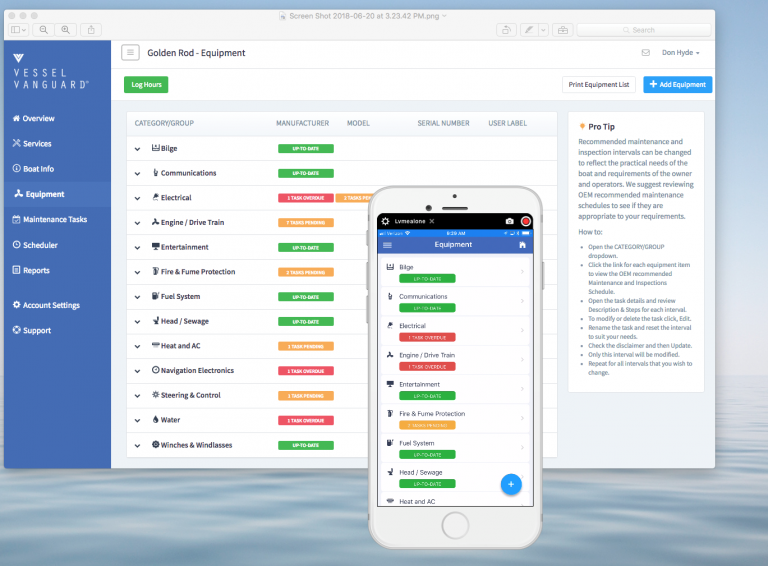 VesselVanguard is a cloud-based application that provides clarity to boat-owners, fleet managers and operators seeking knowledge and control of maintenance and inspection events. Gain peace of mind and reduce ownership costs. Take a moment to learn more about VesselVanguard and how we help make maintenance easy. 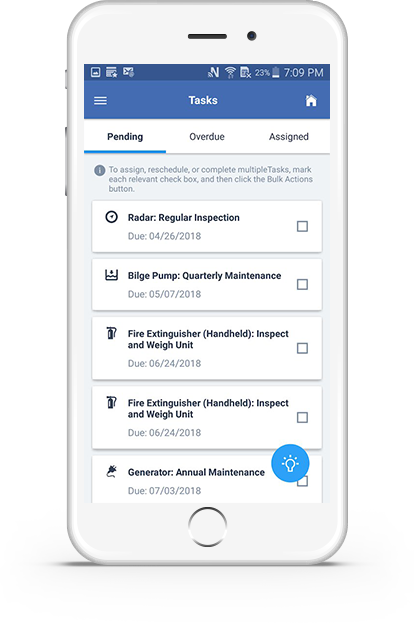 In this short video, you will see the features and benefits of our app that make us the most popular maintenance management app in the world. 20 Minutes a month is all that it takes, see how EASY maintenance management can be. After receiving your boat’s equipment list, we organize all systems by category, including their manuals, warranties, and documentation. 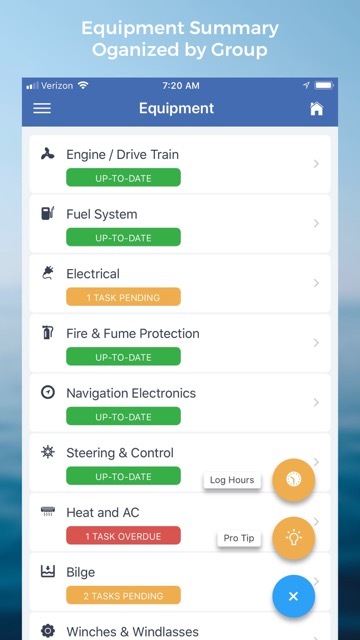 The mobile app also functions offline, enabling access to the boat profile when a wireless connection is unavailable. Once the profile is completed, we put the boat “in-service”, and input existing engine and generator hours. All recommended maintenance and inspection intervals are then re-factored and your boat profile is online and updated in real-time. Second, after the profile is completed we put the boat “in-service”, and input existing engine and generator hours. All recommended maintenance and inspection intervals are then re-factored and your boat profile is online and updating in real-time. 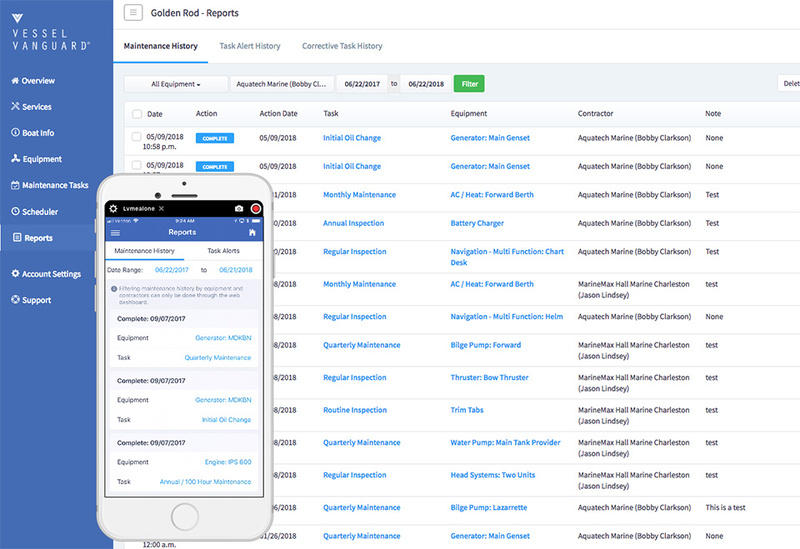 As those dates approach, a Task Alert notice is sent to you and your service team with all the details recommended by the equipment systems manufacturer. Of course, intervals may be modified to accurately reflect practical needs. 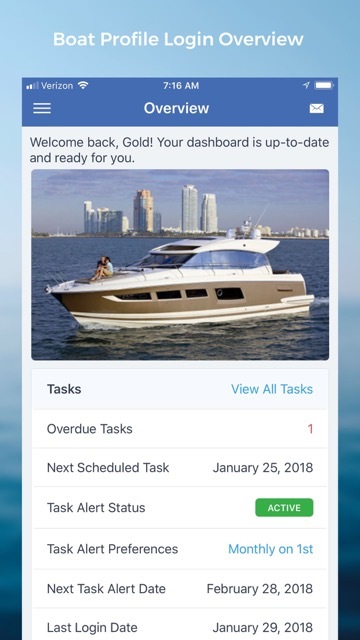 With the click of a mouse you can assign tasks to yourself or others and, when a task is marked complete, the boat profile automatically recalibrates to the next programmed interval and the process repeats itself. Vessel Vanguard turns “Best Guess”, into “Best Practice." At the core of the VesselVanguard Platform is our proprietary marine equipment library, now with over 93,000 equipment models including manuals and warranty terms. 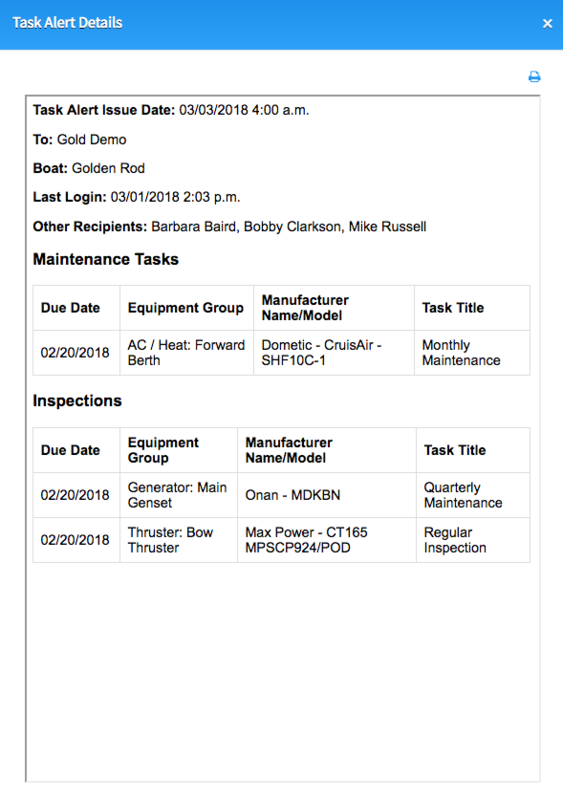 Operating manuals are analyzed and recommended maintenance and inspection schedules are programmed to deliver task descriptions and details on time into your boat profile. The digital boat profile is a dynamic cloud-based repository for all information pertaining to your boat. A dashboard shows you what is needed next and when it is needed, and functional buttons make it easy to assign, reschedule, or complete recommended tasks. 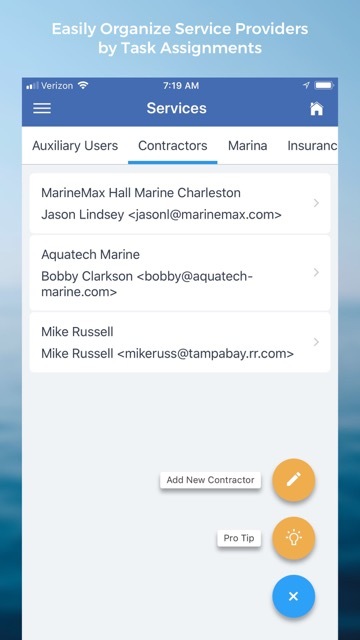 Other functional resources let you customize tasks, add photos, and integrate expiration dates into the profile for insurance, boat registration, and slip rental. Viewing the interactive demo will provide a hands-on understanding of the profile, the value that it delivers, and its ease of use. Twenty minutes a month is all it takes. The profile reports section is a repository for all records in a searchable format that may be filtered by date range, equipment, and service provider. 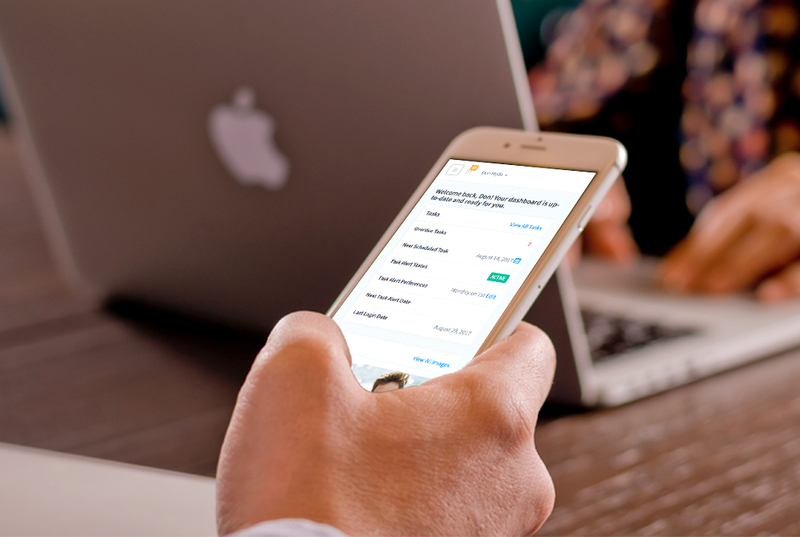 Single-entry task management removes redundant record keeping. Photos, videos, invoices, work orders, etc., may be attached to any event for permanent reference. Reporting history adds value at resale time and necessary when making a warranty claim. 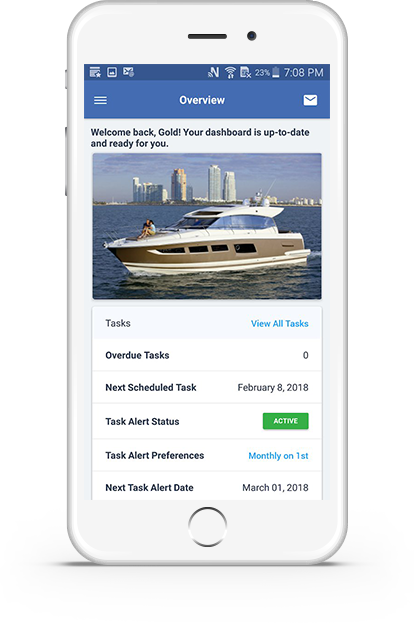 Designed to meet the on-the-go needs and online routines of today’s active boater, our cloud-based service lets you view, manage, and share information about your boat’s maintenance online when and where you need it. 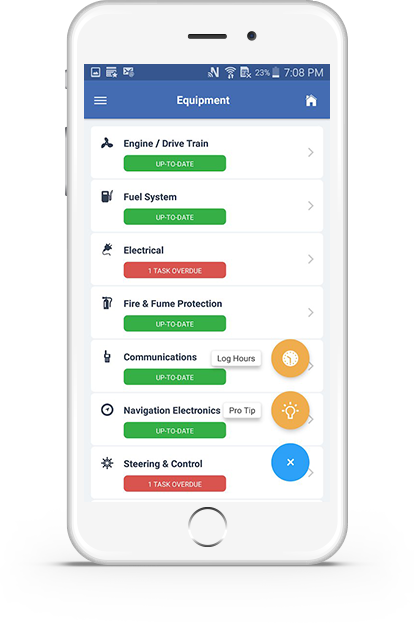 Receive service notices to your mobile phone, look up a boat manual on your tablet device, upload service records from your laptop. Whether you’re at the office, in the coffee shop, or at the helm of your boat, you can easily interface with your online boat profile from anywhere you can get online. You can even sync and download files to your device for access when you’re far from a wifi or mobile signal. Delegating individual service tasks—or even the complete maintenance of your boat— to others is a key feature of VesselVanguard. 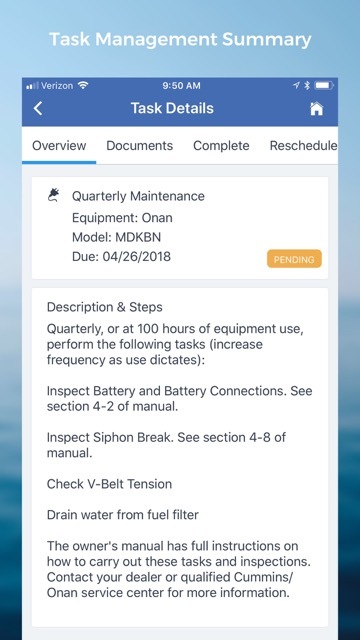 You can easily assign a preferred contractor to receive copies of specific task alerts; allow your favorite boatyard to oversee the maintenance and inspection of entire systems; or even give your trusted service agent complete access to view and manage all the various needs for you boat. 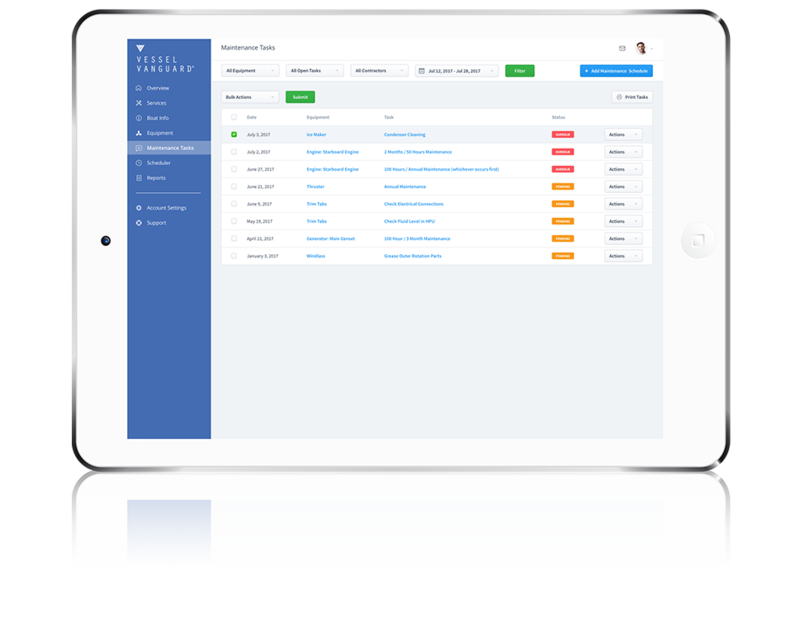 Designated parties get access to only the systems you assign to them, with the ability to upload completed work orders and documents which then become part of the digital ship's log.